I am a traditionalist. I love traditions, and creating memories for family members. There are a few birthday traditions that we have so much fun with I thought I should share them with you. 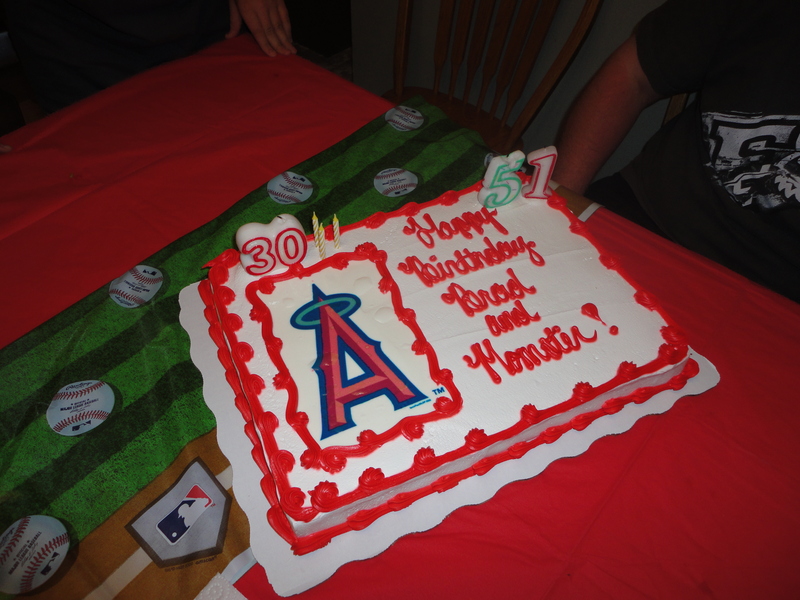 The traditions that go with the birthdays at our house are numerous and fun. We try to have a theme for the birthday parties, whether you are young or old. Iron Man, Batman, Transformers are some of the recent favorites. My oldest son works at Party City so we get great discounts on the party decorations. This makes for lots of fun decorating the house, which is at the top of my “I love to do this” list. We always hang up some sort of “Happy Birthday” banner. Last summer Evan and I made a pretty cool birthday banner that had lots of construction paper and glitter. We are still using this one for some of the birthday celebrations. Once in a while we get some funky birthday hats to wear. This is mostly for the girls in the family. Lots of fun to wear a crown and be the queen for the day. Oh wait that’s right I’m the queen of my house everyday!!! Once our theme is in place then it’s just a matter of planning the menu. The birthday person gets to pick their favorite dinner, and what kind of cake they like. A few years ago we had quite a few “Taco Bar” birthdays right in a row. Everyone wanted tacos and nachos for their birthday dinner!! For my own kids, I have always had some fun traditions. On your birthday morning we wake everyone up early to rush into the birthday boy or girls bedroom for a rousing wake you up rendition of “Happy Birthday to you”, sung as loud as we possibly can. For a few years Travel Man and I would take all of our kids out on the birthday persons’ actual birthday, and then we came to our senses because it was getting way too expensive. After that we started taking out just the birthday honoree by themselves. That was a fun thing to do. It was great to get some alone time with just the birthday boy or girl. On my kids’ sixteenth birthdays I gave each of them a journal, and in the first few pages of the journal I wrote my memories to them of the day they were born. I think this tradition started because the kids would always ask about the day they were born, either on or around their birthdays every year. I wanted them to have the memories to last a lifetime. For the 21st birthdays I make a picture collage for the kids. This is a birth to adulthood collage, a wonderful walk down memory lane. And this year will mark my last collage, as Zach will be turning 21 in July. Oh boo! Happy Birthday to you cha, cha, ca (with synchronized clapping)”, “Happy Birthday to you cha,cha, cha. Happy Birthday, Happy Birthday, Happy Birthday to you, cha, cha, cha! The cha, cha’s are always accompanied by hand clapping. I have to check with my mom or my brother and find out how we started singing this way as I just don’t remember. We’ve been doing it this way since my kids were very young. It’s just so much fun. If you’re a newbie at one of our family birthday parties, when we start on the second chorus it’s definitely a surprise!! Lot and lots of fun traditions can always be expected at the Party House. I have always loved starting up traditions new and old, and look forward to keeping them going strong. The traditions are a great thing to be able to share with your kids, and now the grandson too. And as any Mom would, I hope that the traditions that I have started with my kids are handed down for generations to come. Thanks for the update Mom! Hugs to you and Dad! I”m a big fan of traditions. We have some pretty silly ones (including a “period party” when the girls had their first period, to remove any stigma about it). Love the Cha-Cha birthday song! May steal the idea for use with the grandsons, who both have upcoming birthdays in June. Love your comments Lisa. Thanks for sharing!